I’m late to the show, but I’ve been listening to Phish since 2014 when I finally got “It.” The band has been active since 1983, and almost every show since then has been taped and posted online for fans to enjoy. It feels a little like an archeological dig, going back in time 10, 20, even 30 years and listening to these shows. It’s almost too much music to enjoy in one lifetime. While most of America experienced various eras in popular music, Phish was this little band of Vermont geeks doing their thing and gathering fans by word of mouth, relentless touring, and old-fashioned tape trading. 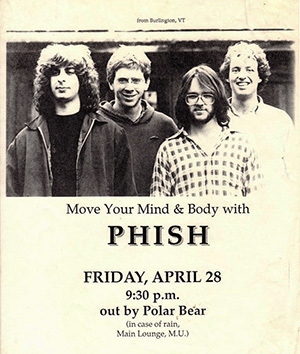 In fact, Phish played a free show at Bowdoin in 1989, and here’s the poster to prove it.